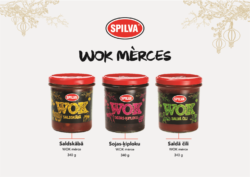 While developing the Eastern cuisine offer on the Latvian and Estonian market, the company Orkla Foods Latvija has started manufacturing of a new product line – Spilva WOK sauces. The new products are manufactured at Orkla Foods Latvija production unit in Spilve, Babite region. ‘The challenge of our technologists was not only to ensure taste qualities, but also ease of use. Our task is to achieve, that each person, who has taken a pan and uses WOK sauce, can feel oneself as a chef of Eastern cuisine!’ informs Dana Erciņa-Užāne, the Marketing Director of Orkla Foods Latvija. 4) Serve with noodles and rice. ‘The good news for everyone who pays attention to product ingredients is that products of the new product line do not contain colorants, preservatives and E substances. We can ensure this thanks to technologies and equipment, which we have introduced in the company over the last three years. A significant stage of manufacturing is ensured by the pasteurization tunnel, installed at the end of 2014, for which the company invested 700,000 euros and which allows ensuring high volume manufacturing without preservatives,’ explains the Marketing Director of Orkla Foods Latvija.